Patients who lose teeth don’t have to lose hope. At our Bozeman dentist practice near Belgrade MT, we offer dental bridges as one of our restorative dentistry options for our patients who are missing teeth and want their smile back. A dental bridge fills the gap in your smile with a beautiful, functional, porcelain crown. Patients who are missing teeth will be able to smile readily again and enjoy themselves in social situations. A dental bridge can restore lost confidence and self esteem. When you have a replacement tooth you will be able to enjoy all the oral activities that you enjoyed before you lost your tooth. You will be able to speak, eat, and smile again. Our dental bridges offer all the functionality of natural teeth and can give you back your brilliant smile. At Bozeman Dentistry, our dental bridges are created with beautiful porcelain crowns. Our crowns are crafted from the highest quality porcelain. They look and feel completely natural in your mouth. The porcelain perfectly mimics the translucence and color of your other teeth. No one will be able to tell that you are wearing a dental bridge or that you ever lost a tooth. 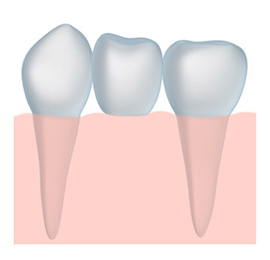 A dental bridge is created by cementing a row of crowns together. When you receive a dental bridge, crowns will be placed on the two teeth in your mouth adjacent to the gap you want filled. Dr. McCormick will fill that gap in your mouth by cementing a porcelain crown to the surrounding crowns, creating a “bridge” of crowns that serves as a functional, beautiful tooth replacement. Multiple teeth can be replaced using dental bridges. Dental bridges are affordable, and can perfectly restore your smile. To find out more about our dental bridges in Bozeman – Belgrade MT area, contact our office today. We would be happy to arrange for a consultation with Dr. McCormick or to answer any questions you might have.